Sambal tumis means fried sambal, one of the most versatile sambal other than sambal belacan. It's more lemak or rich because of the additional garlic, onion and cooked in plenty of oil. Once cooked and stored in sterilised jar will keep at room temperature for months, better than sambal belacan which is not cooked and must be kept in the fridge. If you like Thai nam prik pao you will like sambal tumis. I love this sambal you can use this as a dipping sauce for anything or add to anything you like like noodles, fried tofu and stir fried kangkong etc.... Also great for cooking telur sambal tumis (hard boiled egg sambal) and sambal bilis (asian dried anchovies) using the sambal paste straight from the jar without preparing the spices great for time saving. Here is the recipe. This recipe will make 4 -5 (1 lb) jars, depending on the adjustments to ingredients you used. Adjust the recipe quantity if you like to make less. 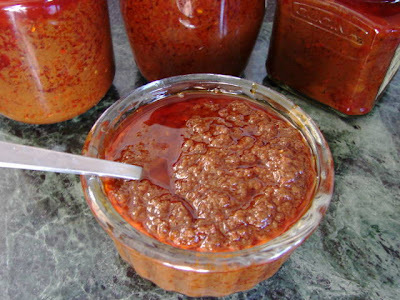 This sambal is very additive you will use it up very quickly, I can assure you. Wear gloves if you want to. Use a pair of scissors and cut the stalk off the dried chillies then cut in half lengthwise to release the seeds. Then soak in tap hot water for about 30 minutes or till softened. Rinse and drain ready to use. Peel the onion and shallots. Cut into small chunks. Peel the garlic. If using Malaysian belacan which is usually in a block, cut into 0.5 cm thick pieces and roast in a dry pan till in medium heat turning every minute or so till the outside turned dried and pale in colour. If using Thai shrimp paste just put small pieces in the pan and roast and turn for few minutes. Blend all the ingredients mentioned above in a mini blender (in several batches) till you get a very smooth paste. If you blender get stained, soak with boiling water and pour in some bleach, the stain will be gone in few minutes. Soak the tamarind with 1 cup of boiling water and leave it to soften and cool. Then squeeze with your hand to release the pulp then strain to extract the juice. Pour the tamarind juice in a large sauce pan or wok and reduce the liquid to about a third. Then pour in the spice paste and cook it till hot at medium low heat till bubbling hot while stirring frequently to prevent the liquid sticking and spitting. Once the mixture is very hot, reduce the heat to low and continue simmering for about 30 minutes, stirring frequently and cover the pot/wok (ajar to release steam) while you are not stirring. Then add in the oil, salt and sugar and continue cooking for another 15 minutes or so, still stirring frequently and cover the lid when not stirring, but be very careful the oil will spit don't get too close. The sambal is then ready to eat or put into jars. While the sambal is cooking, clean enough glass jars to fill 5 lb of sambal, then leave the jars not the lids in a low oven for about 10 - 15 minutes till very hot and dried. Turn the heat off then put the lids in the oven to dry. Put a clean ladle and jam funnel too to sterilise in the oven. Pour the very hot sambal into hot jars right to the top, clean any spill with clean kitchen towel then screw the top on tight right away and leave to cool. Once cooled the jars will be vacuum sealed and so will kept for long time. This sambal is ok to eat right away but better leave to mature for at least 1 week before eating. If stored in sterilised jar will keep for months. If kept in plastic container you need to keep it in the fridge and use within 2 weeks or so. If the vacuum sealed jar is opened keep in fridge and use within few weeks. When roasting the belacan (shrimp paste) and cooking the sambal, if you don't want your house smell for the next few days best do this outdoor using a portable cooker or gas ring on a bbq. If you add the oil at the beginning when cooking the mixture, it will spit like crazy because of the high water content and can be dangerous. The amount of oil you add depends on how you like it, if you like me who like the sambal glistening and rich I will add all the 400ml, if you like the sambal very lean use 1 cup or less but the sambal will look dull, not that tasty and keeping is probably not as good with more oil. i love how you have explained this is in great detail. i tried one recipe which did not turn out to be so good. shall try yours next. v nice recipes on your blog. are you on twitter, too? Thanks for stopping by. Hope you like this recipe. No I am not on Twitter. It is too hip for an old dinosaur like me :)..
sorry, i see i have posted this q here re twitter. wonderful blog. You've have finally got into blogging. Love your blog, nice setup and pictures and lovely recipes too. Keep it up. The way I roast my belacan here in the UK, (where most of the year, it's too cold to cook outside) - is by wrapping my belacan pieces in foil paper and roasting that in the pan. It still does the job, and reduced the smell drastically!! Tried this few months ago it was fantastic, will cook it again today. Thanks for the recipe. I made it. I'm really glad I cooked this outside because it was stinky! Amazing how after everything is combined and cooked, it turns into something wonderful. Cut the recipe in half because I wasn't sure what I am going to do with this very new sauce (for me). I cook a lot of chinese food. Not sure how to use this sauce except the way I would a bean paste. Could you recommend some specific ways to use this in a dish. How about a noodle soup? Love your site! Thanks. Hi Sambal tumis is Malaysian/Indonesian condiment/sauce. There are several recipes on my blog using this sauce, http://sunflower-recipes.blogspot.com/2009/04/sambal-tumis.html#uds-search-results. This sauce is also nice adding to noodles as sauce, adding to curry sauce, stir fry vegetableslike cabbage, kangkong (water spinach) etc, or eaten with baked potatoes or rice as condiment.